The Trout Zone: Hungry Brown!!! I've seen some interesting things that trout have spit out before. Half digested shad during the shad kill on the Caney? Yep. A mouthful of earthworms after a heavy rain? Check. However, I had never caught a fish with another fish sticking out of its throat, until yesterday that is. I've heard plenty of stories, just never seen it for myself. After finishing up another half day guide trip, I headed up to fish in the afternoon. Not too long after starting, I hooked a feisty brown that was somewhere between 10-12 inches, and after getting it in the net I noticed that its mouth didn't look right. A quick glance showed a tail protruding out of its throat that was nearly as large as its own tail! Even more amazing is that this fish swirled once on my nymph and then ate on the 2nd drift. Talk about a hungry brown!!! Even with a mouth full of sculpin it still wanted a #10 nymph for dessert. A Brown Trout Motto: "Its a fish eat fish world". Browns are amazing. A hungry Brown has no scruples. Exactly what Mark said, these guys play by completely different rules! I've seen brookies cough up a 3inch minnow after taking a bomber. 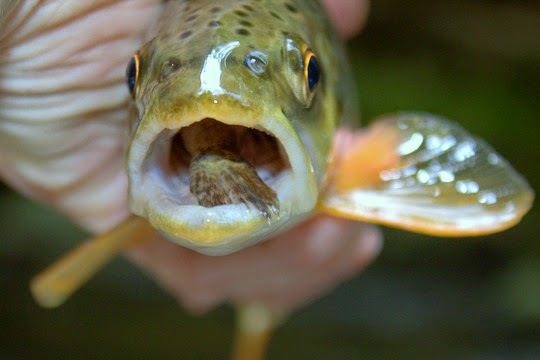 When you see a trout with two mouths, something in each mouth, let me know. I want a pictures. Thanks David. Awesome photo, thanks for sharing!